This year we offer a unique opportunity to a group of 50 dancers to meet and train whilst focussing on one of two recent repertory pieces of Eastman. Dancers from the cast will provide professional guidance and feedback. Group A will explore the movement material from the opera Satyagraha, which premiered in 2017 at Theater Basel. Group B delves into Stoic from 2018, the latest creation with GöteborgsOperans Danskompani. In the morning we offer a variety of guest classes by Eastman dancers and professional teachers. Find the Eastman Summer Intensive on facebook! The Eastman Summer Intensive 2019 takes place from August 12th to 17th. The participant's presence is expected on all 6 compulsory workshop days and on the final showing on the last day of the program. Participants chose between two repertory pieces for their afternoon class. All participants follow the same curriculum before noon. The exact schedule for the week will be announced as soon as possible. 9:00 - 10:00: Warm up class (a.o. Yoga, Kung-Fu...). 10:15 - 12:30: Guest classes (a.o. Ballet, Floorwork, Urban Techniques...). This class contains a 15 minute break. 13:30 - 17:30: Repertory Class (Stoic or Satyagraha). We will also offer an interesting side program for participants. 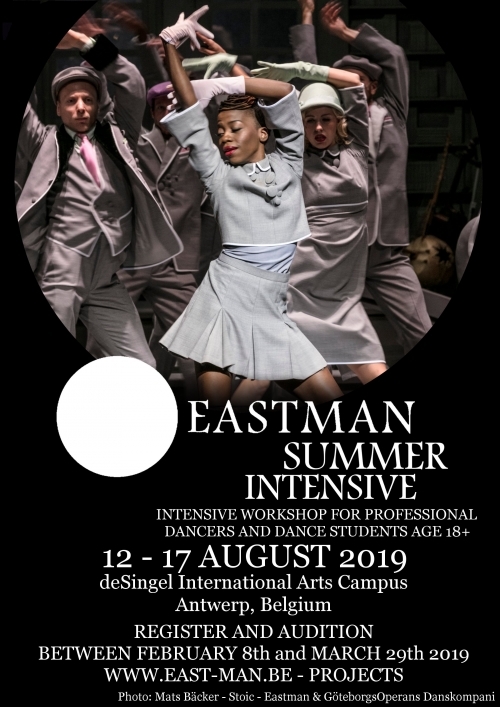 The registration fee for the Eastman Summer Intensive 2019 is €440,00. (including your registration cost, fee for 6 workshop days and lunch for 6 workshop days, excluding accommodation costs). Please make sure you carefully read the audition procedure of the Eastman Summer Intensive 2019, before you submit the registration form. To audition for the Eastman Summer Intensive 2019, please fill out the (complete) registration form using the link below. After submitting this form, you will receive a confirmation on your email address within 2 working days. Please note that we cannot accept incomplete auditions, we will contact you if your audition is not complete. Headshot / Face picture (recent): In high quality/resolution and in CLOSE UP. 3 May 2019 - Make your payment of the registration fee to confirm your participation before May 3rd.